A few weeks ago, Christie and I decided to pause our Friends on Netflix marathons, peel ourselves off our couches, and make our way to the MoMA. 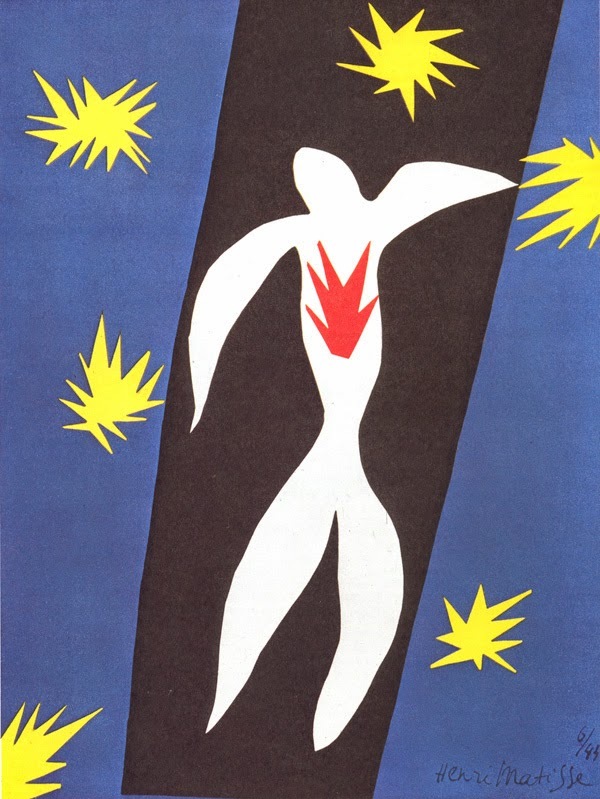 The MoMA is one of my favorite museums and until February 10, it is home to an exhibit of Henri Matisse's cut-outs. It's important to me that when you're reading this post, you are saying the French "ahn-REE" and not the boring English "Henry" in your head. This gent deserves it. While I've been to Henri Matisse exhibits before, including one at the Met a few years ago with my dad, I hadn't known (or maybe I hadn't remembered) much about his life. Matisse used cut-outs in many of his paintings in his early years to help him with perspective and lighting, but he turned to it exclusively when he found himself in a wheelchair and sometimes bedridden later in life. Henri had his assistants paint white paper in different colors and hold the paper while he did his magic with the scissors. He then had them pin the pieces in different places on his walls until he was happy with how everything looked. Henri called what he did with his cut-outs "painting with scissors" and found much joy in it. I understand this - I mean, who among us doesn't have fun when wrapping Christmas presents when the scissors just glide through the paper effortlessly? I know I'm not alone here. Christie and I loved this exhibit. We enjoyed looking at the pieces without reading the names and guessing what they were. 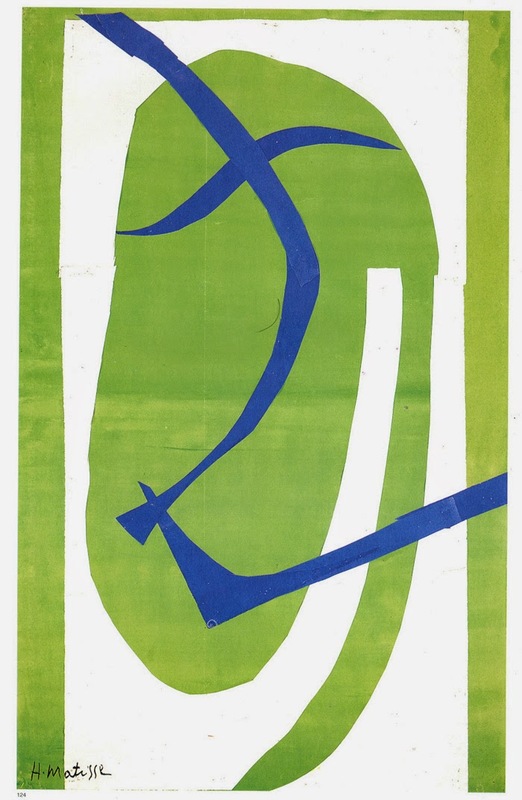 As much as Matisse was completely literal at some times, he was just as often much more abstract. His "pomegranates" looked like kidneys, but sometimes a fern is just a fern. At first glance, you can tell the following piece is a person, and there's fire and starbursts, but when you look at the title and see it's Icarus, flying too close to the sun, you see the whole story. Thinking a little more abstractly, Christie and I both agreed that the below cut-out was a person screaming, but this one turned out to be more literal and was a Sword-Swallower. Christie got the biggest props from me for her close guess of Ninja Turtle for the below, which is actually called, "Japanese Mask." As the exhibit goes through time, the crowds disburse as the pieces become larger and more impressive. There is one piece that basically turns a small side room into a swimming pool with abstract divers, and others that fill large walls completely - this is during his intense pomegranate phase. 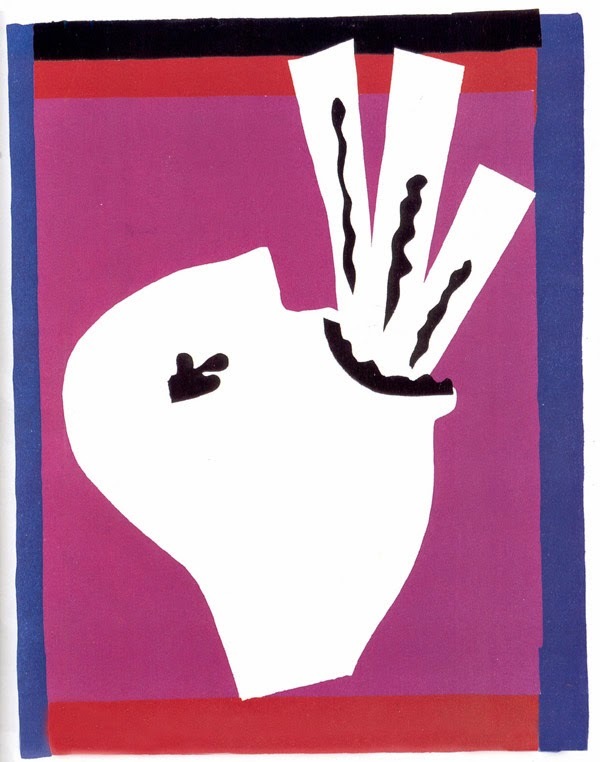 Matisse also was commissioned to create stained-glass window specs with his cut-outs. The exhibit has one of the actual stained-glass windows on display as well. Our friend Henri had already had a great career as an artist when he fell ill, but he didn't let anything stop him from what he loved. He created a whole new art form and kept doing what he enjoyed in the last years of his life. If you're faced with people telling you that you can't do something you want to do, be like Henri and tell them to "Cut It Out!" For more on the exhibit, check out this recent CBS Sunday Morning piece.